It was not till the news of the sad death of Lilienthal reached America in the summer of 1896 that we again gave more than passing attention to the sub­ject of flying. We then studied with great interest Chanute's "Progress in Flying Machines," Langley's "Experiments in Aerodynamics," the "Aeronau­tical Annuals" of 1905, 1906, and 1907, and several pamphlets published by the Smithsonian Institution, especially arti­cles by Lilienthal and extracts from Mouillard's "Empire of the Air." The larger works gave us a good understand­ing of the nature of the flying problem, and the difficulties in past attempts to solve it, while Mouillard and Lilienthal, the great missionaries of the flying cause, infected us with their own unquenchable enthusiasm, and transformed idle curiosity into the active zeal of workers. In the field of aviation there were two schools. 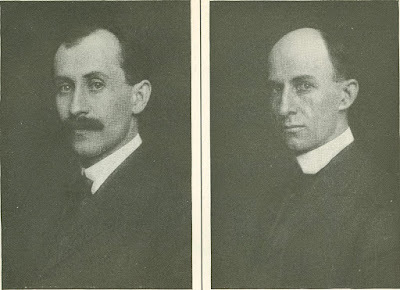 The first, represented by such men as Professor Langley and Sir Hiram Maxim, gave chief attention to power flight; the second, represented by Lilien­thal, Mouillard, and Chanute, to soaring flight. Our sympathies were with the lat­ter school, partly from impatience at the wasteful extravagance of mounting deli­cate and costly machinery on wings which no one knew how to manage, and partly, no doubt, from the extraordinary charm and enthusiasm with which the apostles of soaring flight set forth the beauties of sailing through the air on fixed wings, deriving the motive power from the wind itself. The balancing of a flyer may seem, at first thought, to be a very simple matter, yet almost every experimenter had found in this the one point which he could not satisfactorily master. Many different methods were tried. Some experimenters placed the center of gravity far below the wings, in the belief that the weight would naturally seek to remain at the lowest point. It was true, that, like the pendu­lum, it tended to seek the lowest point; but also, like the pendulum, it tended to oscillate in a manner destructive of all stability. A more satisfactory system, es­pecially for lateral balance, was that of arranging the wings in the shape of a broad v, to form a dihedral angle, with the center low and the wing-tips elevated. In theory this was an automatic system, but in practice it had two serious defects: first, it tended to keep the machine oscil­lating; and, second, its usefulness was restricted to calm air. In a slightly modified form the same system was applied to the fore-and-aft balance. The main aeroplane was set at a positive angle, and a horizontal tail at a negative angle, while the center of grav­ity was placed far forward. As in the case of lateral control, there was a ten­dency to constant undulation, and the very forces which caused a restoration of balance in calms, caused a disturbance of the balance in winds. Notwithstand­ing the known limitations of this princi­ple, it had been embodied in almost every prominent flying-machine which had been built. After considering the practical effect of the dihedral principle, we reached the conclusion that a flyer founded upon it might be of interest from a scientific point of view, but could be of no value in a practical way. We therefore resolved to try a fundamentally different principle. We would arrange the machine so that it would not tend to right itself. We would make it as inert as possible to the effects of change of direction or speed, and thus reduce the effects of wind-gusts to a min­imum. We would do this in the fore-and-aft stability by giving the aeroplanes a peculiar shape; and in the lateral balance, by arching the surfaces from tip to tip, just .the reverse of what our predecessors had done. Then by some suitable con­trivance, actuated by the operator, forces should be brought into play to regulate the balance. 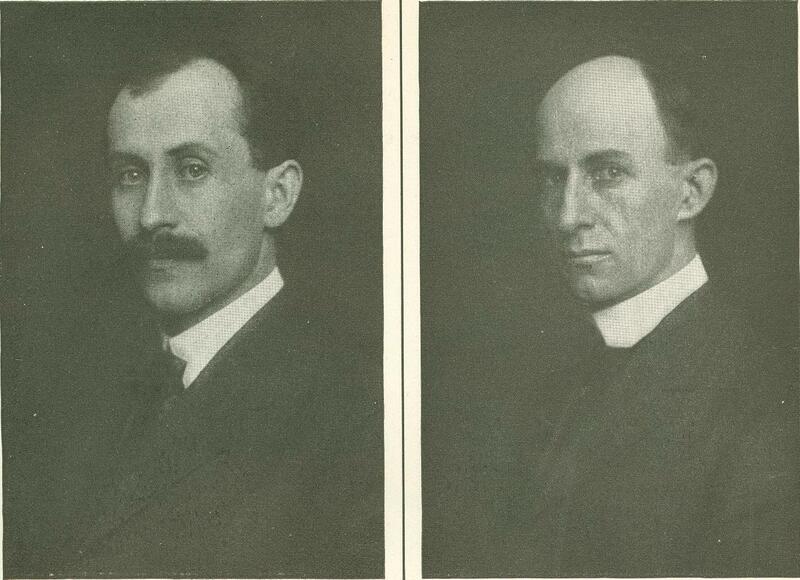 Lilienthal and Chanute had guided and balanced their machines by shifting the weight of the operator's body. But this method seemed to us incapable of expan­sion to meet large conditions, because the weight to be moved and the distance of possible motion were limited, while the disturbing forces steadily increased, both with wing area and with wind velocity. In order to meet the needs of large ma­chines, we wished to employ some system whereby the operator could vary at will the inclination of different parts of the wings, and thus obtain from the wind forces to restore the balance which the wind itself had disturbed. This could easily be done by using wings capable of being warped, and by supplementary ad­justable surfaces in the shape of rudders. As the forces obtainable for control would necessarily increase in the same ratio as the disturbing forces, the method seemed capable of expansion to an almost, un­limited extent. A happy device was dis­covered whereby the apparently rigid system of superposed surfaces, invented by Wenham, and improved by Stringfellow and Chanute, could be warped in a most unexpected way, so that the aeroplanes could be presented on the right and left sides at different angles to the wind. This, with an adjustable, horizontal front rud­der, formed the main feature of our first glider. The period from 1885 to 1900 was one of unexampled activity in aeronautics, and for a time there was high hope that the age of flying was at hand. But Maxim, after spending $100,000, aban­doned the work; the Ader machine, built at the expense of the French Government was a failure; Lilienthal and Filcher were killed in experiments; and Chanute and many others, from one cause or an­other, had relaxed their efforts, though it subsequently became known that Profes­sor Langley was still secretly at work on a machine for the United States Govern­ment. The public, discouraged by the failures and tragedies just witnessed, con­sidered flight beyond the reach of man, and classed its adherents with the inven­tors of perpetual motion. 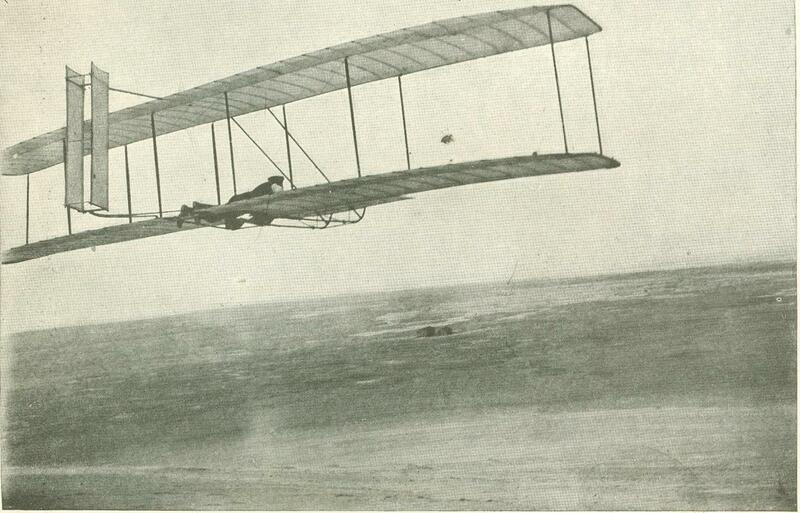 We began our active experiments at the close of this period, in October, 1900, at Kitty Hawk, North Carolina. Our ma­chine was designed to be flown as a kite, with a man on board, in winds of from fifteen to twenty miles an hour. But, upon trial, it was found that much stronger winds were required to lift it. Suitable winds not being plentiful, we found it necessary, in order to test the new balancing system, to fly the machine as a kite without a man on board, opera­ting the levers through cords from the ground. This did not give the practice anticipated, but it inspired confidence in the new system of balance. In the summer of 1901 we became per­sonally acquainted with Mr. Chanute. When he learned that we were inter­ested in flying as a sport, and not with any expectation of recovering the money we were expending on it, he gave us much encourage­ment. At our in­vitation, he spent several weeks with us at our camp at Kill Devil Hill, four miles south of Kitty Hawk, during our experiments of that and the two succeed­ing years. 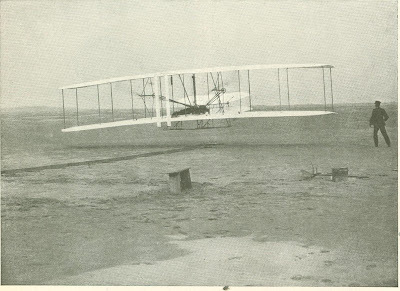 He also witnessed one flight of the power machine near Dayton, Ohio, in October, 1904. The machine of 1901 was built with the shape of surface used by Lilienthal, curved from front to rear like the seg­ment of a parabola, with a curvature the depth of its cord; but to make doubly sure that it would have sufficient lifting capacity when flown as a kite in fifteen or twenty mile winds, we in­creased the area from 165 square feet, used in 1900, to 308 square feet - a size much larger than Lilienthal, Pilcher, or Chanute had deemed safe. Upon trial, however, the lifting capacity again fell very far short of calculation, so that the idea of securing practice while flying as a kite had to be abandoned. Mr. Chanute, who wit­nessed the experi­ments, told us that the trouble was not due to poor con­struction of the ma­chine. We saw only one other explana­tion - that the tables of air-pressures in general use were in­correct. We then turned to gliding - coasting downhill on the air - as the only method of getting the desired practice in balanc­ing a machine. After a few minutes' practice we were able to make glides of over 300 feet, and in a few days were safely operating in twenty-seven mile winds. In these experiments we met with several unexpected phenomena. We found that, contrary to the teachings of the books, the center of pressure on a curved surface traveled backward when the sur­face was inclined, at small angles, more and more edgewise to the wind. We also discovered that in free flight, when the wing on one side of the machine was pre­sented to the wind at a greater angle than the one on the other side, the wing with the greater angle descended, and the machine turned in a direction just the reverse of what we were led to expect when flying the machine as a kite. The larger angle gave more resistance to for­ward motion, and reduced the speed of the wing on that side. The decrease in speed more than counterbalanced the ef­fect of the larger angle. The addition of a fixed vertical vane in the rear in­creased the trouble, and made the ma­chine absolutely dangerous. It was some time before a remedy was discovered. This consisted of movable rudders work­ing in conjunction with the twisting of the wings. The details of this arrange­ment are given in our patent specifica­tions, published several years ago. The experiments of 1901 were far from encouraging. Although Mr. Chanute as­sured us that, both in control and in weight carried per horse-power, the re­sults obtained were better than those of any of our predecessors, yet we saw that the calculations upon which all flying-machines had been based were unreliable, and that all were simply groping in the dark. Having set out with absolute faith in the existing scientific data, we were driven to doubt one thing after another, till finally, after two years of experiment, we cast it all aside, and decided to rely entirely upon our own investigations. Truth and error were everywhere so in­timately mixed as to be undistinguishable. Nevertheless, the time expended in pre­liminary study of books was not misspent, for they gave us a good general under­standing of the subject, and enabled us at the outset to avoid effort in many di­rections in which results would have been hopeless. The standard for measurements of wind-pressures is the force produced by a current of air of one mile per hour veloc­ity striking square against a plane of one square-foot area. The practical difficul­ties of obtaining an exact measurement of this force have been great. The measure­ments by different recognized authorities vary fifty per cent. When this simplest of measurements presents so great difficul­ties, what shall be said of the troubles encountered by those who attempt to find the pressure at each angle as the plane is inclined more and more edgewise to the wind? In the eighteenth century the French Academy prepared tables giving such information, and at a later date the Aeronautical Society of Great Britain made similar experiments. Many persons likewise published measurements and formulas; but the results were so dis­cordant that Professor Langley undertook a new series of measurements, the results of which form the basis of his celebrated work, "Experiments in Aerodynamics." Yet a critical examination of the data upon which he based his conclusions as to the pressures at small angles shows re­sults so various as to make many of his conclusions little better than guess-work. To work intelligently, one needs to know the effects of a multitude of varia­tions that could be incorporated in the surfaces of flying-machines. The pres­sures on squares are different from those on rectangles, circles, triangles, or ellipses; arched surfaces differ from planes, and vary among themselves according to the depth of curvature; true arcs differ from parabolas, and the latter differ among themselves; thick surfaces differ from thin, and surfaces thicker in one place than another vary in pressure when the positions of maximum thickness are dif­ferent; some surfaces are most efficient at one angle, others at other angles. The shape of the edge also makes a difference, so that thousands of combinations are pos­sible in so simple a thing as a wing. We had taken up aeronautics merely as a sport. We reluctantly entered upon the scientific side of it. But we soon found the work so fascinating that we were drawn into it deeper and deeper. Two testing-machines were built, which we be­lieved would avoid the errors to which the measurements of others had been subject. After making preliminary measurements on a great number of different-shaped surfaces, to secure a general understand­ing of the subject, we began systematic measurements of standard surfaces, so varied in design as to bring out the under­lying causes of differences noted in their pressures. Measurements were tabulated on nearly fifty of these at all angles from zero to 45 degrees, at intervals of 272 de­grees, Measurements were also secured showing the effects on each other when surfaces are superposed, or when they fol­low one another. Some strange results were obtained. One surface, with a heavy roll at the front edge, showed the same lift for all angles from 772 to 45 degrees. A square plane, contrary to the measurements of all our predecessors, gave a greater pressure at 30 degrees than at 45 degrees. This seemed so anomalous that we were almost ready to doubt our own measurements, when a simple test was suggested. A weather-vane, with two planes attached to the pointer at an angle of 80 degrees with each other, was made. According to our tables, such a vane would be in unstable equilibrium when pointing di­rectly into the wind; for if by chance the wind should happen to strike one plane at 39 degrees and the other at 41 degrees, the plane with the smaller angle would have the greater pressure, and the pointer would be turned still farther out of the course of the wind until the two vanes again secured equal pressures, which would be at approximately 30 and 50 de­grees. But the vane performed in this very manner. Further corroboration of the tables was obtained in experiments with a new glider at Kill Devil Hill the next season. In September and October, 1902, nearly one thousand gliding flights were made, several of which covered distances of over 600 feet. Some, made against a wind of thirty-six miles an hour, gave proof of the effectiveness of the devices for control. With this machine, in the autumn of 1903, we made a number of flights in which we remained in the air for over a minute, often soaring for a considerable time in one spot, without any descent at all. Lit­tle wonder that our unscientific assistant should think the only thing needed to keep it indefinitely in the air would be a coat of feathers to make it light! With accurate data for making calcu­lations, and a system of balance effective in winds as well as in calms, we were now in a position, we thought, to build a suc­cessful power-flyer. The first designs provided for a total weight of 600 pounds, including the operator and an eight horse-power motor. But, upon comple­tion, the motor gave more power than had been estimated, and this allowed 150 pounds to be added for strengthening the wings and other parts. Our tables made the designing of the wings an easy matter; and as screw-pro­pellers are simply wings traveling in a spiral course, we anticipated no trouble from this source. We had thought of getting the theory of the screw-propeller from the marine engineers, and then, by applying our tables of air-pressures to their formulas of designing air-propellers suitable for our purpose. But so far as we could learn, the marine engineers pos­sessed only empirical formulas, and the exact action of the screw-propeller, after a century of use, was still very obscure. As we were not in a position to undertake a long series of practical ex­periments to discover a pro­peller suitable for our machine, it seemed necessary to obtain such a thorough understanding of the theory of its reactions as would enable us to design them from calculation alone. What at first seemed a simple problem became more complex the longer we studied it. With the machine moving forward, the air flying backward, the propellers turn­ing sidewise, and nothing standing still, it seemed impossible to find a starting-point from which to trace the various simultaneous reactions. Contemplation of it was confusing. After long arguments, we often found ourselves in the ludicrous position of each having been converted to the other's side, with no more agreement than when the discussion began. It was not till several months had passed, and every phase of the problem had been thrashed over and over, that the various reactions began to untangle them­selves. When once a clear under­standing had been obtained, there was no difficulty in designing suit­able propellers, with proper diam­eter, pitch, and area of blade, to meet the requirements of the flyer. High efficiency in a screw-propeller is not dependent upon any particular or peculiar shape, and there is no such thing as a "best" screw. A propeller giving a high dynamic efficiency when used upon one machine may be almost worthless when used upon another. The propeller should in every case be designed to meet the par­ticular conditions of the machine to which it is to be applied. Our first propellers, built entirely from calculation, gave in useful work 66 per cent of the power ex­pended. This was about one third more than had been secured by Maxim or Langley. The first flights with the power-machine were made on the 17th of December, 1903. Only five persons besides ourselves were present. These were Messrs. John T. Daniels, W. S. Dough, and A. D. Etheridge of the Kill Devil Life Saving Station; Mr. W. C. Brinkley of Manteo, and Mr. John Ward of Naghead. Al­though a general invitation had been extended to the people living within five or six miles, not many were willing to face the rigors of a cold December wind in order to see, as they no doubt thought, another flying machine not fly. 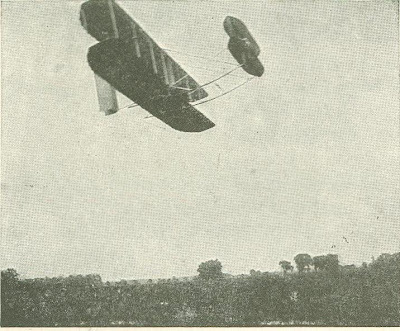 The first flight lasted only twelve seconds, a flight very modest compared with that of birds, but it was, nevertheless, the first in the history of the world in which a machine carrying a man had raised itself by its own power into the air in free flight, had sailed forward on a level course without reduction of speed, and had finally landed without being wrecked. The second and third flights were a little longer, and the fourth lasted fifty-nine seconds, covering a distance of 852 feet over the ground against a twenty-mile wind. After the last flight, the machine was carried back to camp and set down in what was thought to be a safe place. But a few minutes later, while we were en­gaged in conversation about the flights, a sudden gust of wind struck the machine, and started to turn it over. All made a rush to stop it, but we were too late. Mr. Daniels, a giant in stature and strength, was lifted off his feet, and falling inside; between the surfaces, was shaken about like a rattle in a box as the machine rolled over and over. He finally fell out upon the sand with nothing worse than painful bruises, but the damage to the machine caused a discontinuance of experiments. In the spring of 1904, through the kindness of Mr. Torrence Huffman of Dayton, Ohio, we were permitted to erect a shed, and to continue experiments, on what is known as the Huffman Prairie, at Simms Station, eight miles east of Day­ton. The new machine was heavier and stronger, but similar to the one flown at Kill Devil Hill. When it was ready for its first trial, every newspaper in Dayton was notified, and about a dozen representatives of the press were present. Our only request was that no pictures be taken, and that the reports be unsensational, so as not to attract crowds to our experi­ment grounds. There were probably fifty persons altogether on the ground. When preparations had been completed, a wind of only three or four miles was blowing, insufficient for starting on so short a track, but since many had come a long way to see the machine in action, an at­tempt was made. To add to the other difficulty, the engine refused to work properly. The machine, after running the length of the track, slid off the end without rising into the air at all. Several of the newspaper men returned the next day, but were again disappointed. The engine performed badly, and after a glide of only sixty feet, the machine came to the ground. Further trial was postponed till the motor could be put in better run­ning condition. The reporters had now, no doubt, lost confidence in the machine, though their reports, in kindness, con­cealed it. Later, when they heard that we were making flights of several minutes' duration, knowing that longer flights had been made with air-ships; and not know­ing any essential difference between air­ships and flying-machines, they were but little interested. We had not been flying long in 1904 before we found that the problem of equilibrium had not as yet been entirely solved. Sometimes, in making a circle, the machine would turn over sidewise despite anything the operator could do, although, under the same conditions in ordinary straight flight, it could have been righted in an instant. In one flight, in 1905, while circling around a honey lo­cust-tree at a height of about fifty feet, the machine suddenly began to turn up on one wing, and took a course toward the tree. The operator, not relishing the idea of landing in a thorn-tree, attempted to reach the ground. The left wing, how­ever, struck the tree at a height of ten or twelve feet from the ground, and carried away several branches; but the flight, which had already covered a distance of six miles, was continued to the starting-point. The causes of these troubles - too tech­nical for explanation here - were not entirely overcome till the end of Septem­ber, 1905. The flights then rapidly in­creased in length, till experiments were discontinued after the 5th of October, on account of the number of people attracted to the field. Although made on a ground open on every side, and bordered on two sides by much traveled thoroughfares, with electric cars passing every hour, and seen by all the people living in the neigh­borhood for miles around, and by several hundred others, yet these flights have been made by some newspapers the subject of a great "mystery." A practical flyer having been finally realized, we spent the years 1906 and 1907 in constructing new machines and in business negotiations. It was not till May of this year that experiments (discontinued in October, 1905) were resumed at Kill Devil Hill, North Carolina. The recent flights were made to test the ability of our machine to meet the requirements of a contract with the United States Govern­ment to furnish a flyer capable of carry­ing two men and sufficient fuel supplies for a flight of 125 miles, with a speed of forty miles an hour. 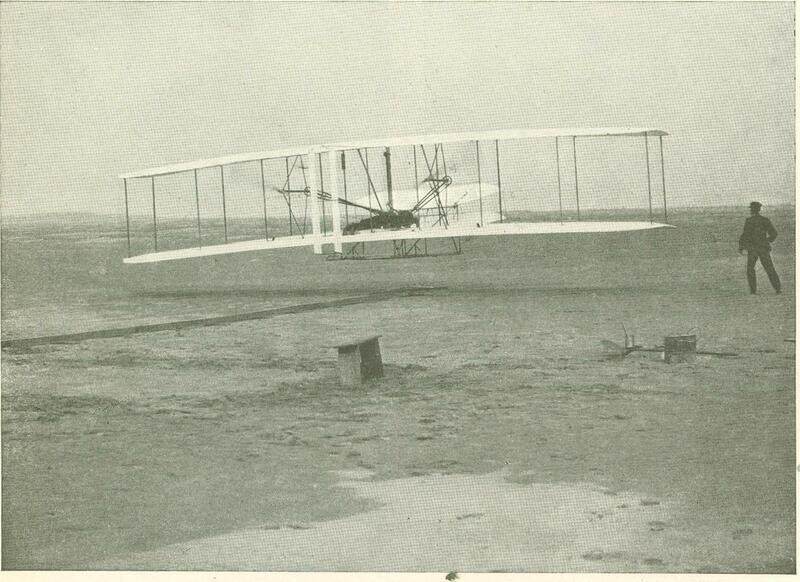 The machine used in these tests was the same one with which the flights were made at Simms Station in 1905, though several changes had been made to meet present requirements. The operator assumed a sitting position, in­stead of lying prone, as in 1905, and a seat was added for a passenger. A larger motor was installed, and radiators and gasolene reservoirs of larger capacity re­placed those previously used. No attempt was made to make high or long flights. In order to show the general reader the way in which the machine operates, let us fancy ourselves ready for the start. The machine is placed upon a single rail track facing the wind, and is securely fastened with a cable. The engine is put in mo­tion, and the propellers in the rear whir. You take your seat at the center of the machine beside the operator. He slips the cable, and you shoot forward. An assistant who has been holding the ma­chine in balance on the rail, starts for­ward with you, but before you have gone fifty feet the speed is too great for him, and he lets go. Before reaching the end of the track the operator moves the front rudder, and the machine lifts from the rail like a. kite supported by the pressure of the air underneath it. The ground under you is at first a perfect blur, but as you rise the objects become clearer. At a height of one hundred feet you feel hardly any motion at all, except for the wind which strikes your face. If you did not take the precaution to fasten your hat before starting, you have probably lost it by this time. The operator moves a lever: the right wing rises, and the machine swings about to the left. You make a very short turn, yet you do not feel the sensation of being thrown from your seat, so often experienced in automobile and railway travel. You find yourself facing toward the point from which you started. The objects on the ground now seem to be moving at much higher speed, though you perceive no change in the pressure of the wind on your face. You know then that you are traveling with the wind. When you near the starting-point the operator stops the motor while still high in the air. The machine coasts down at on oblique angle to the ground and after sliding fifty or a hundred feet comes to rest. Although the machine often lands when traveling at a speed of a mile a minute, you feel no shock whatever, and cannot, in fact, tell the exact moments at which it first touched the ground. The motor close beside you kept up an almost deafening roar during the whole flight, yet in your excitement, you did not notice till it stopped! Our experiments have been conducted entirely at our own expense. In the be­ginning we had no thought of recovering what we were expending, which was not great, and was limited to what we could afford for recreation. Later, when a suc­cessful flight had been made with a motor, we gave up the business in which we were engaged, to devote our entire time and capital to the development of a machine for practical uses. As soon as our condi­tion is such that constant attention to bus­iness is not required, we expect to prepare for publication the results of our labora­tory experiments, which alone made an early solution of the flying problem pos­sible. Originally published in The Century Magazine in September of 1908.